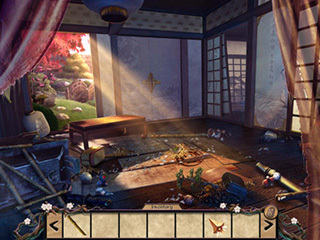 Take a step back in time to the Samurai days out in the Far East in Mythic Wonders: Child of Prophecy Collector's Edition. 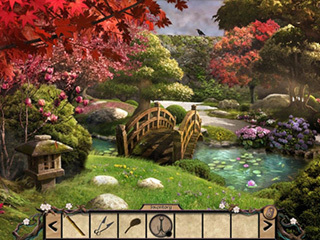 This is the epic sequel to the first Mythic Wonders game, and hopefully there will be many more to come in this chilled yet thrilling Hidden Object Puzzle Adventure game. Set in 17th century Japan, you play the role of a housemaid who happens upon a discovery in a tiny bundle on her front door step. Can you figure out what all is happening behind the veil of metaphysics in this quirky little game? Five years ago, someone left a basket on the doorstep. The contents of the basket were one human baby and scrolls that are written in some crazy language that you don’t understand. There’s also a map in there. You named the child Nobu and have been raising him without any incident until one day, he is kidnapped! Now you have got to get to the bottom of this heinous crime and figure out who took your baby and why. The answers to these questions may not be as simple as they seem, for it seems that you’ve come across the Child of Prophecy. The graphics in this game are nice. They have a calming, Eastern feel to them that add sort of a Zen feeling to whatever room you are playing in. They aren’t as over-the-top as in some other HOPA games, which is good for those of us who have milder taste. The music is absolutely delightful and you can download the music and other cool media stuff if you’ll get the collector’s edition. There’s also a helpful strategy guide in the collector’s edition that will help you along the way. Worth looking into for yourself. This is Mythic Wonders: Child of Prophecy review. Download this game here.